DETROIT >> Right now the furthest thing on Ken Holland’s mind is when Johan Franzen will return to the ice for the Detroit Wings. Franzen, 35, missed his third straight game Saturday night in Montreal after leaving Joe Louis Arena Tuesday after the morning skate prior to the Wings taking on the Tampa Bay Lightning. He has suffered multi concussions in his career, the last of which occurred last season after a blind-side hit by Edmonton’s Rob Klinkhammer last January. He finished the game, but began experiencing concussion-like symptoms the next day. Franzen didn’t return the rest of the season. Franzen, who averaged just under 13 minutes of ice time in two games, picking up one assist, was placed on short-term injured reserve (minimum seven days). He was cleared to resume playing prior to the start of training camp. Franzen, who has 187 goals and 182 assists in 600 regular season games with the Wings, said up until the time of training camp that his headaches weren’t completely gone, but they’re not as severe. Franzen has 42 goals and 39 assists in 107 playoff games. DETROIT >> Daniel Cleary has rethought things and has decided to report to Grand Rapids. He’ll be there for practice on Tuesday. “I just needed some time to think it through,” Cleary said. “I’m going to go down and be a good pro. Cleary being a good pro is exactly what Wings general manager Ken Holland is hoping for out of his veteran forward. Cleary was placed on waivers by the Wings on Oct. 8, a move that was done to clear a roster spot for Jakub Kindl, who had been sidelined with an eye infection. Cleary, 35, signed a one-year deal last month worth $950,000. His salary won’t count against the cap while he’s with the Griffins. “Dan Cleary has a passion for hockey,” Holland said. “He’s been involved with the union on the perimeter of past CBA’s so he has some interest in the business of the game. He’s been here for 10 years. Even last year I had people down there in the locker room telling me the positive impact he brought to the team every day, in the gym, supporting and pushing his teammates. Given the adversity he faced he was a real pro. I think that’s important for young players to see. DETROIT >> After being a healthy scratch the first two games of the season, Tomas Jurco made his debut Tuesday against Tampa Bay. Jurco was supposed to replace Landon Ferraro on the fourth line, but Johan Franzen was a late scratch so he took his place on a line with Brad Richards and Tomas Tatar. 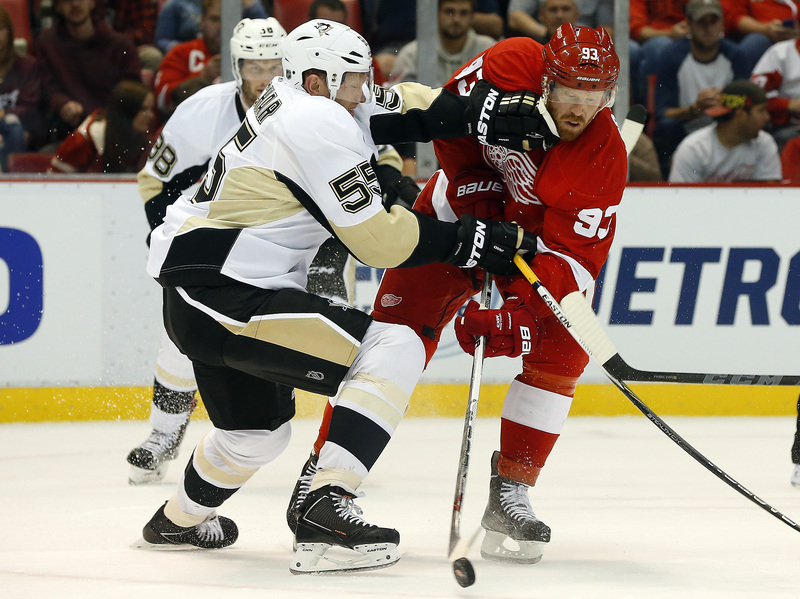 The Wings said Franzen wasn’t feeling 100-percent and was pulled as a precaution. They didn’t know if it was concussion-symptom related. DETROIT >> Darren Helm dropped the gray jersey, reserved for injured or healthy scratch players, and skated with the fourth line at practice Monday. Helm, who is still on injured reserve, has been out since the first day of training camp when he suffered a concussion and slightly separated shoulder in a collision with prospect Jerome Verrier. If Helm is activated Tuesday the Wings will need to clear a roster spot, which could be done by sending defenseman Alexey Marchenko to Grand Rapids. DETROIT >> Just two games into the season, Justin Abdelkader is showing that last year’s offensive uptick wasn’t a fluke. Coming off a career-high 23-goal campaign last season, Abdelkader has four through two games this year. “I think he’s got great a combination of physicality and skill set and he’s got offensive smarts to go with it,” Wings coach Jeff Blashill said after practice Monday at Joe Louis Arena. “I think one of those things, having a physical type presence on a line, sometimes those guys don’t have offensive smarts to play with elite offensive thinkers. He does. After a hat trick to open the season last Friday, the second of his career, he added the winner in the Wings’ 4-3 win over Carolina to go with an assist on Saturday. Abdelkader also had a career-high 21 assists last season. 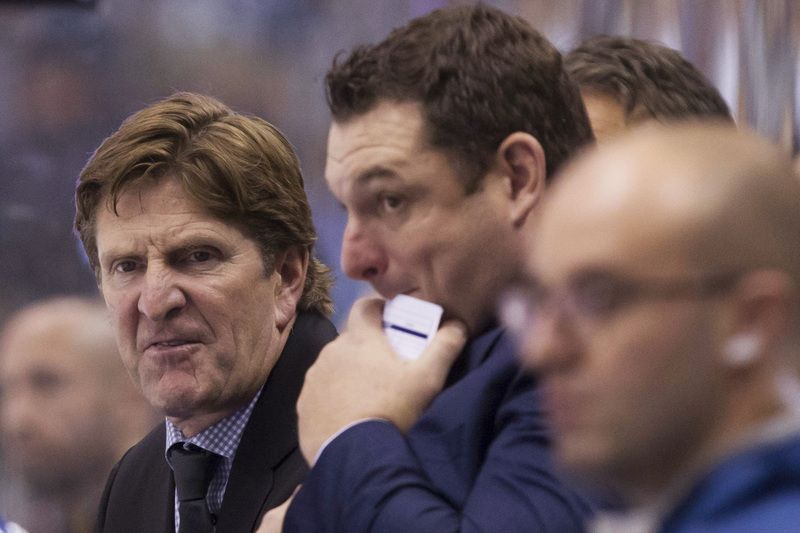 DETROIT >> The Detroit Red Wings can officially now move on from their former coach, Mike Babcock. “Maybe it meant a little more than playing the Anaheim Mighty Ducks,” Justin Abdelkader said Friday after the Wings’ 4-0 win over the Toronto Maple Leafs at Joe Louis Arena. “I’m not going to lie there, but at the same time now that this game is past us we look to the future and turn the page, or close the book on that story line. 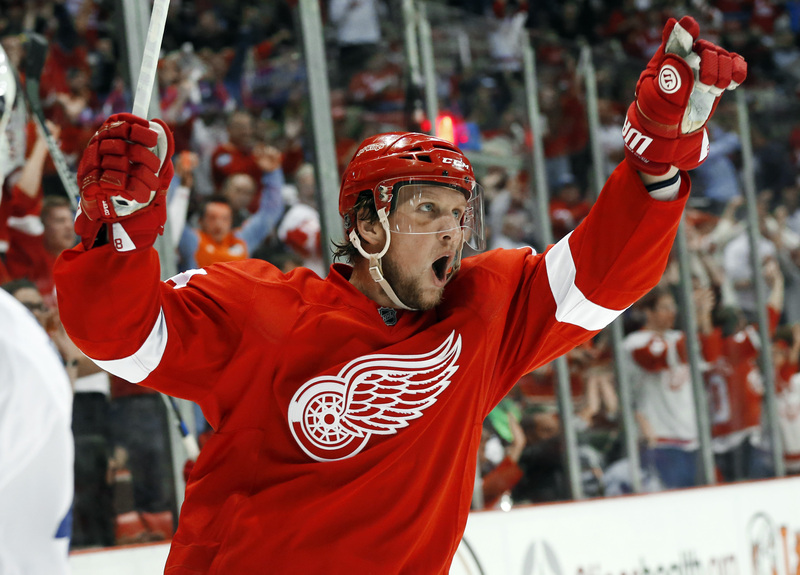 Abdelkader was able to rub it in just a bit more recording a hat trick in the win against his former coach. “You know it’s our old coach,” Abdelkader said. “There’s pride, but it’s hockey. It’s business and people move on, people go to different places. We turn the page now. After 10 seasons behind the Wings’ bench, where he led the team to the playoffs every season, Babcock landed an eight-year, $50 million deal with Toronto making him the highest paid coach in the NHL. The team promoted Jeff Blashill, who had spent the last three seasons in Grand Rapids after one season as Babcock’s assistant in Detroit. “We’re focused on our group and he’s focused on his,” Abdelkader said. “He was a big part of this organization for 10 years, had some great years here. It’s always tough to turn the page. The Leafs finished 27th in the overall league standings last season. Under Babcock, the Wings were eliminated in the first round of the playoffs in three of the last four seasons and haven’t made it out of the second round of the playoffs since 2009. DETROIT >> Dylan Larkin is taking a pretty simple approach to his first NHL game. Larkin played in five preseason games against veteran lineups that included Pittsburgh’s Sidney Crosby, Chicago’s Jonathan Toews and Boston’s Patrice Bergeron. He totaled three goals and an assist. He’s the first teenager in 25 years to make their NHL debut on opening night. Mike Sillinger was the last Wing to do so. Larkin will play on the top line Henrik Zetterberg and Justin Abdelkader. 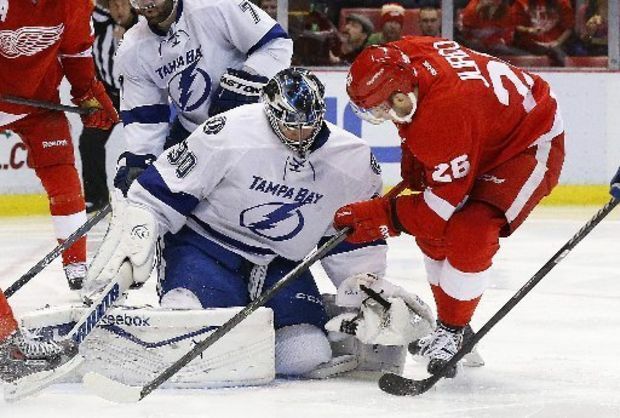 “It’s pretty easy to play with him,” Larkin said of playing with Zetterberg. “I try and just focus on getting open and I know he’s going to find me at some point. As far as him being a mentor, a leader, it’s unbelievable just watching him in practice. He makes things so easy for me.